The son of a prominent mob boss in Chicago muscles his way into Hell’s Kitchen with a plan to unseat The Kingpin. Shortly after taking the reins, the new guy in town outs Matt Murdock to the world as Daredevil. On the heels of dealing with this PR disaster, Matt takes a case defending The White Panther, recently accused of murder. In the last few years, I’ve become a big fan of the Man without Fear. I’ve made my way through Miller’s groundbreaking run in the 80s, Kevin Smith’s controversial Guardian Devil arc and have been up to date on Mark Waid’s current run. However, as of today, nothing has impressed me as much as the team of Brian Michael Bendis and Alex Maleev. The incredible artwork really puts this one on a level above the others. The first quarter in particular where Alex experiments with a free flowing layout coupled with varying styles blew my mind. Eventually the artwork settles down and falls into a consistent style that works well with the darker material presented. Alex paints some beautiful full page shots of Daredevil exploring Hell’s Kitchen at night, soaked to the bone from torrential rain. The great thing about this collection is that we’re presented with Matt Murdock just as much if not more than scenes with Daredevil taking down baddies. 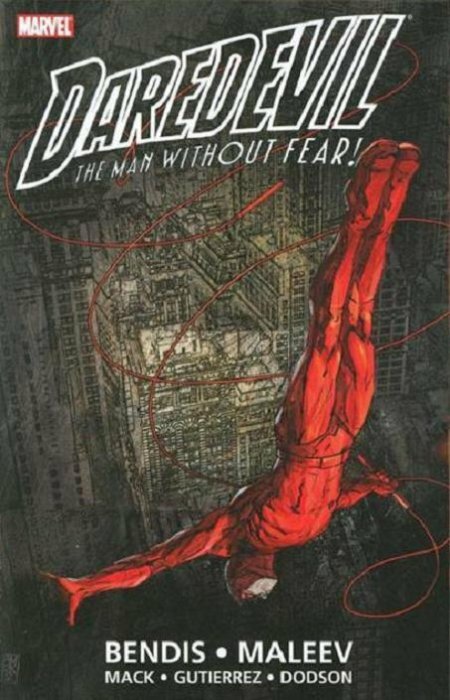 As much as I love getting great action sequences where Daredevil just obliterates his adversaries, the courtroom battles and the drama of Matt’s personal life can often be just as, if not more, interesting. The entire last story takes us into a New York City courtroom where forgotten crime fighter The White Panther is on trial for robbing an electronics store and subsequently murdering an on-scene police officer. Bendis turns the intensity up to eleven to the point where you’re never quite sure where the story is headed. He presents adequate arguments from both Matt and the DA where if you weren’t already aware of Panther’s innocence, you wouldn’t know which party to believe. There’s so much happening in these pages that even at a staggering 400+ pages, I wasn’t ready for it to end. Luckily for me, I’ve got Volume two ready to go. November 25, 2013 in Alex Maleev, Brian Michael Bendis, Fiction.